trusted tablets The Patrick Henry High School robotics team, the Patribots, took home its second regional championship at the end of March after a three-day long competition in Salt Lake City, Utah. They also took home their first award for Imagery at Del Mar Fairgrounds, held Feb. 28-March 3. This is the seventh year for the team but its first bringing home the Imagery Award. viagra buy now After two days of qualifying matches in Del Mar, the Patribots were ranked fourth with a 9-2-1 record. Senior Harrison Lange and junior Timber Carrey led efforts in the Patribot pit to repair the robot while programming, led by Zach Royal, worked to troubleshoot problems and improve the code. Together they overcame a burnt-out motor, broken chains, and a severely bent axle, affectionately named Mr. Hanky, which cost them one of their rounds. Mr. Hanky became the team’s good luck charm for the rest of their remaining matches as the Patribots made it to the elimination finals. http://sanfordbiggers.com/bio order now After qualifications, the Patribots sat as the fourth alliance captain, with team 1159 Ramona Rampage (ranked 13th) from Alhambra, and 3255 the SuperNURDs (ranked 11th) from Escondido. The Red Alliance was sadly defeated in the quarterfinals after a series of robot complications and dying batteries, however, the Patribots went on to win the Imagery Award for their cohesive image as a team in their attire, handouts, robot, and pit designs. The team had been striving for the award through the season as marketing planned from their big-picture concept, down to the details of the font of their team’s name on the pins. At the Utah Regional, the Patribots’ big, quick robot proved itself in qualifying matches by being the third-highest scoring robot, although it was only ranked 23rd overall. That definitely got noticed and in the last picks of alliances. The first ranked alliance — team 3478 out of Mexico and team 971 out of Mountain View, California — picked the Patribots as their third alliance partner. During finals, the team made it to victory by playing shut-down defense on the other alliances robots. With a final score of: Blue 43, Red 69, the Patribots were champions. Drive Team Coach Adria Van Loan, drivers Timber Carey and Harrison Lange, Human Player Julia Providell-Appenfelder, and technician Fabian Cuevas celebrated with their allies on the field. Team members in the stands burst into celebration. This year’s game, Destination: Deep Space, challenges teams to work together in alliances of three to place hatch panels and cargo up to seven feet high as well as climb a platform 19-inches high. Teams play up to 12 qualifying matches, rotating so they potentially play with and against all other teams at competition. The Patribots are organized into subsystem groups that work to complete the demanding tasks of the 2019 challenge. Working Monday through Thursday from 2:30 p.m. to 9 p.m., 9 a.m. to 9 p.m. on Saturdays, and noon to 5 p.m. on Sundays, members balance demanding courses, like AP physics, calculus, and other sports, all while they dedicate hours to design, build, and program the robot. The 2019 robot stands 48 inches tall and, when extended, places hatches up to the top of the “rockets” at seven feet high. Members of the Patribots work with local schools to share robotics experiences that inspire interest in the application of math and science. Be on the lookout: The Patribots will be providing robotics camps in the San Carlos area this summer to inspire future Patribots to engage in STEM, school, and their community. 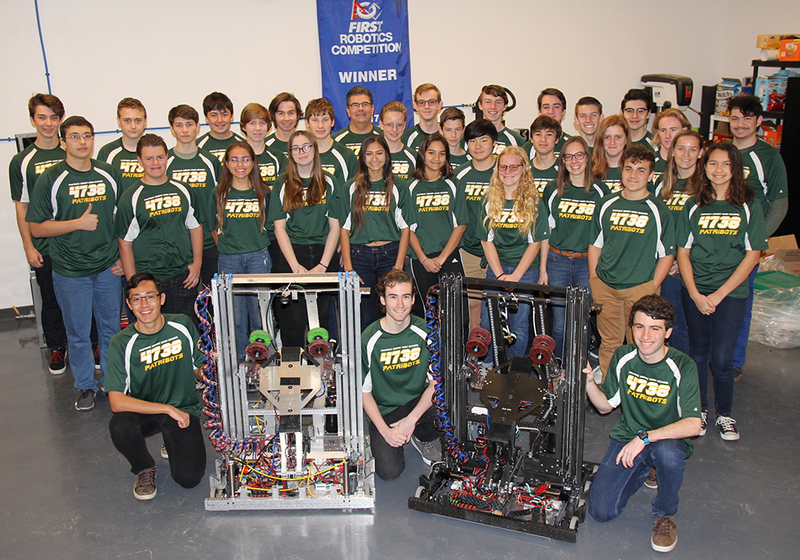 The Patribots will represent Patrick Henry High School in the 2019 FIRST Robotics Competition Championships held April 17-21 in Houston, Texas. A field of 450 elite teams from over 40 nations will compete to take home the prestigious title of FRC Champion. In order to get to the competition, the team will need to raise $10,000 and are currently looking for additional corporate sponsors and donations. Current sponsors include Qualcomm, DoD STEM, BrainCorp, SolidWorks, PHHS Foundation, and Natural Networks Inc.
— Adria Van Loan-Polselli, Emilee Morgan and Fabian Cuevas coach the Patrick Henry Patribots.